PLAINVILLE – Caitlin Barker and Sam Lozefski had taken the court at Plainville High School for four years, but felt some added nerves on Saturday evening after the two were honored for Senior Night before their final home game against West Haven in a battle of Blue Devils. 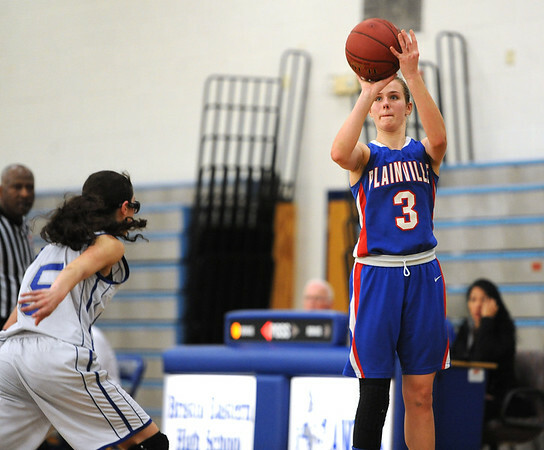 Barker, Lozefski and the rest of Plainville showed those nerves in the early going, failing to record a point through the first four minutes of the game and ending the opening period with a narrow three point lead. By the second quarter, the nerves were gone, and Plainville caught fire behind its senior duo to race to a 62-52 win. Plainville opened the decisive second quarter with back-to-back threes by Barker and Lillian Wazorko to ignite a 13-0 run capped off by another three, this time from Lozefski, marking the fourth different Plainville shooter to connect from long range in the game’s first 12 minutes. Lozefski added six more points on two old fashioned 3-point plays before the dominant second quarter ended, leaving Plainville with a 17-point lead behind 25 points in the period. Barker had 14 points by halftime and finished with 22. Lozefski added 11, while sophomore Jaida Vasquez pitched in 15 behind six field goals. By the second half, the story was about the pair of seniors still putting on a show for the home crowd one last time, leading the way with Vasquez to build a 24 point lead late in the third quarter. West Haven slowly cut into the Plainville lead through the fourth, pulling within 10 with two minutes left, but Plainville collected itself and finished West Haven off with relatively minimal drama. Barker and Lozefski were taken out one final time late in the fourth quarter to a loud ovation from the crowd. Both teams struggled from the floor to start the game, with each being held scoreless until Barker knocked down a baseline jumper to spark an 8-2 run for Plainville. Barker was all over Plainville’s first quarter run, knocking down a pair of free throws before stealing the ensuing inbounds pass and putting home an easy layup, finishing a quick four-point swing. West Haven responded with five-straight points behind a 3-pointer from Sarah Evangelista to cut the lead to two, but Jaida Vasquez responded with a three of her own on the other end to put Plainville back in control for good. The win marked Plainville’s second of the season against West Haven, winning by a combined score of 129-92. West Haven: Diamond Dixon 3-0-7, Brianna Sebastian 1-0-2, Natalia Frazier 3-0-6, Ny’Aire Serrano 5-0-10, Keegan Riccio 2-0-4, Sarah Evangelista 3-0-7, Dynastee Francis 2-2-8, Elena Petrie 1-2-4, Savannah Gray 2-0-4. Totals: 22-4-52. Plainville: Caitlin Barker 8-3-22 , Samantha Lozefski 4-2-11, Tessa Susco 0-2-2, Jaida Vasquez 7-0-15, Lillian Wazorko 3-0-7, Krystyna Miller 2-1-5. Totals: 24-8-62. Three-point goals: Sarah Evangelista (WH) 1, Lillian Wazorko (P) 1, Jaida Vasquez (P) 1, Caitlin Barker (P) 3, Sam Lozefski (P) 1, Diamond Dixon (WH) 1, Dynastee Francis (WH) 2. Records: Plainville 12-8, West Haven 5-13. Posted in The Bristol Press, Plainville on Saturday, 9 February 2019 20:49. Updated: Saturday, 9 February 2019 20:51.